As I mentioned a couple of weeks ago, I am standing aside from co-hosting Library Loot. If you think that you might be interested in hosting with Claire, get in touch with her! I didn't have very much loot at all this week. 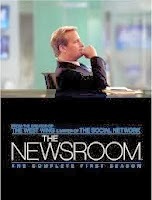 In fact that only thing I got out from the library was The Newsroom Season 1. I really need to go check out my library. I know where it is but haven't been there yet. Go Kelly! Maybe it will be better than the last one. I am thinking I am only going to get time to watch one episode on this borrow. Might have to borrow it again in January when my son is away and I will have more access to the TV! Love that TV show, Can I have season 3 now? Did you like the end of season 2? I have heard mixed reports about it.